The Broad Run tollhouse property in Ashburn once served as a stopping point for weary travelers. More than a century later, the historic site may once again function as a center for trekkers to cool their heels. County officials are hoping the more than 200-year-old property can serve as an educational trailhead for hikers along the planned Broad Run Trail and Potomac Heritage National Scenic Trail near the soon to be developed Kincora property. The property sits at the intersection of Routes 7 and 28 off the Broad Run. Loudoun supervisors on July 6 agreed to purchase the property for $230,000, contingent on favorable studies of the site. County officials are hoping to have studies completed by the end of September, according to Lewis Raunch, director of Loudoun’s department of construction and waste management. If the site is found to be in sound condition, plans for renovation and a designated use of the tollhouse would still have to go before a commission and get legislative approval, said John Merrithew, assistant director of planning. “This would be a nice trailhead location. It would be a nice stop,” Merrithew said. The tollhouse and accompanying stone bridge were built in 1820, a result of 1809 legislation from the Virginia General Assembly that created the Leesburg Turnpike Co. The company was tasked with building a toll road from Leesburg to the Little River Turnpike in Alexandria. The tollhouse, once constructed, was where travelers paid a fee to continue on Leesburg Turnpike. The toll road was abandoned at the onset of the Civil War. However, the toll house continued in use for several more decades, with travelers still paying a fee to cross its bridge. During Prohibition, according to local historian Eugene Scheel, it was also a place were thirsty travelers would purchase illegal alcohol. The Broad Run tollhouse and bridge ruins are the only such combination in existence in Virginia today, according to Lori Kimball, president of the Loudoun Preservation Society. The structure was one of the first properties in the state to be listed on the National Register of Historic Places in 1970. The bridge, which was constructed out of huge stones from quarries in the Blue Ridge Mountains, was destroyed in 1972 by flood waters from Hurricane Agnes. The property, which was purchased by a private owner in 2002, was foreclosed on in 2007. In May 2010, during Loudoun supervisors’ discussions over whether to approve Kincora Village – a 424-acre mixed-use property that will accompany a minor league baseball team – developers of the project agreed to purchase the tollhouse property for $300,000 if a nonprofit group took responsibility for its renovations. Kincora’s developer, Norton Scott LLC of Ashburn, set a deadline on the agreement for Dec. 31, 2010. However, no nonprofit group ever stepped up to take on renovations of the tollhouse, Kimball said. Kimball said a trailhead is probably the best use of the property, given its location. “It’s in a tough location so it would be difficult to be used for some other purposes,” she said. The tollhouse could easily serve as an educational center to visitors about the history of transportation in the area. “It could tell such a story about how the turnpike was built and just the history that it’s seen,” Kimball said. 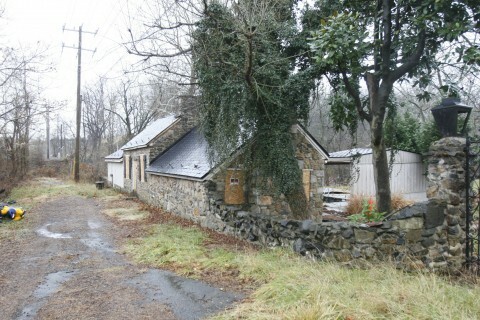 County officials are hoping this tollhouse can serve as an educational trailhead for hikers along the planned Broad Run Trail and Potomac Heritage National Scenic Trail near the soon to be developed Kincora property. Photo Courtesy/Loudoun County. My family and I lived in the toll house from the late 50's until it was flooded by Hurricane Agnes in 1972. After the flood we lived in the Big House above the quarry. I do hope it can eventually become an educational trailhead.